I had a rather ugly brown Le Creuset roaster that I gave to a friend when his girlfriend booted him out and he had nothing. After I gave it away, I kinda regretted it but it was terribly ugly so I got over it. About 6 years ago, I found the identical Le Creuset pan in a junk shop and bought it. Not a single week has gone by that I didn't use the pan in some way, shape or form. This summer, I dropped the lid on the floor. My initial reaction was a plea that the lid not crack the tile. The opposite happened. In one of those mathematical long shots, a statistical improbability, the lid and floor collided at a perfect sweet spot and the lid lost. It split in a perfect line from the edge to the knob. I prayed it would go not further and tried to gingerly use it a couple of times but then it split into two equal parts. I didn't want to get rid of my pan, but without a lid, it languished on the shelf. Then one day I started looking on ebay. Nothing seemed to be the right size and finally, a big blue lid came on the market. It seems to be the exact size I needed and since I had looked for quite some time and since this was the first one I had seen that seemed to be the right size, I bought it. Shipping the lid cost more than the lid itself. Together they cost more than I paid for the pan which was exponentially less than buying a new one. I put the blue lid on the brown pot and it has been in the oven every day since! I couldn't be happier. It reminded me of a professor from Alabama. He had gone to Oxford and became friend with the son of Duchess. He visited their home and the Duchess was smitten by this young man who would listen to her stories of old furniture, paintings and china. She was especially fond of a set of Wedgwood that she had eaten from as a child. She lamented that the pattern had been discontinued and several dished were missing lids. When he was invited to spend Christmas at the house, he tried to find an excuse not to go. It was Christmas after all, and what would he put under the tree? After reluctantly agreeing to go, he found himself visiting a town with an old Wedgwood factory. He inquired at the shop about the discontinued pattern and was led into a rather large room, stacked high with bits and pieces of old Wedgwood. He searched for quite some time and managed to find a couple of discarded lids that matched the Duchess' pattern. They were under the tree for her. Needless to say she was thrilled and touched that this young American had actually listened to her stories. I thought of that story several years ago when I stopped to get a bottle of wine for a friend. She had a huge kitchen that was always bustling. Her big, old stove was a workhorse, but the knobs has been been lost over the years and in order to get the eyes to come on or to adjust the temperature, the single working knob was move to the naked metal stumps of each eye that needed tending. She always complained about the damn stove knobs. As I headed toward the liquor store, I noticed a hardware store across the street, so I detoured. In the back or this jam-packed, old store was a display of stove knobs. I found the knobs I needed and bought them for less than a bottle of wine. When I gave her the bag and she saw the knobs, she wept. Over and over she said that she had complained for years and no one ever listened. So be advised as the gift-giving season approaches -- sometimes the right gift is as simple as a old, blue lid. 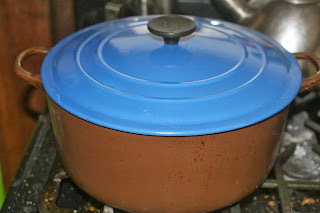 It must be a very old pot--I've never seen Le Creuset in brown before and they've been on my radar for a long time. I enjoy your blog as well, and I love the stories about the Duchesse's Wedgewood and the stove knobs. I love this story. Gifts such as these are what Christmas gifts are meant to be.